Air pollution in cities is rising at an alarming rate, new data from the World Health Organisation has revealed, particularly in emerging economies like India, where pollutants harm human health and hastening glacier melt. Indian cities have some of the highest concentrations of particulate pollution, with as many as 14 cities among the worst 30, Bloomberg reported. China, which has been plagued by air pollution, has improved its air quality since 2011 and now has only five cities in the top 30. Noxious smog is spreading across the Ganga and Indus river basins, with Peshawar in Pakistan and Dhaka in Bangladesh also amongst the worst cities. Larger soot particles from regions also combine and get deposited on the ice in the Himalayas, accelerating glacier melt. 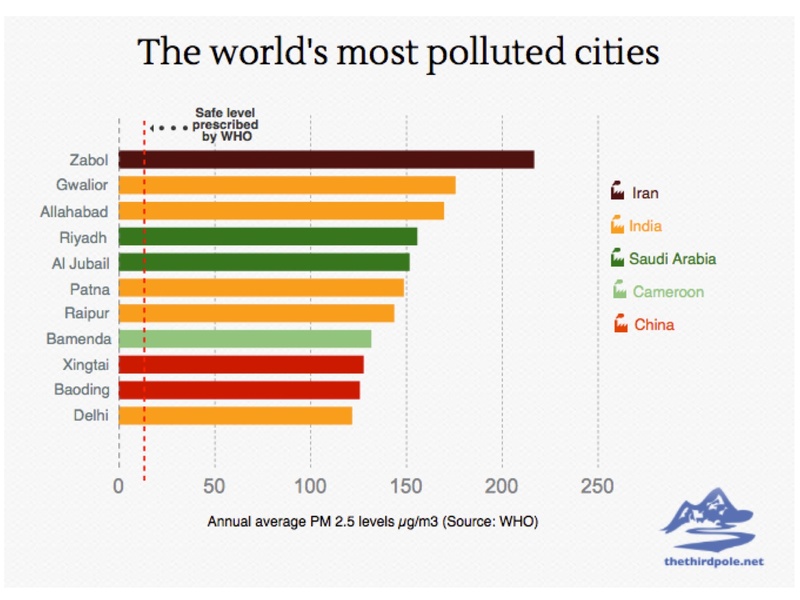 Fast growing cities in Saudi Arabia and Iran are also on the list of most-polluted urban areas with the highest levels of PM 2.5, tiny airborne particles, spewed out by cars factories and coal power stations that can lodge in the lungs or enter the bloodstream. Global air pollution levels rose as much as 8% in the five years between 2008 and 2013, according to the database released on 12 May. Cities in poorer regions are suffering the most. All the 300 plus cities in middle- and low-income countries reported alarming rise, often five times beyond safety limits. In Indian cities levels of larger PM10 particles (mostly dust, sand and soot) is also severe. These particles deflect heat and make urban areas warmer, contributing to climate change in lower altitudes. 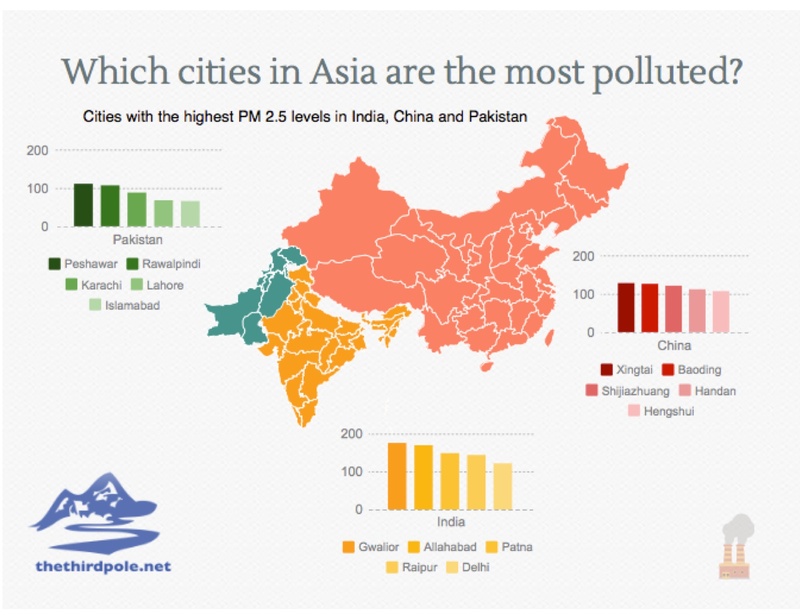 India has eight cities among the world’s worst 30 for PM 10 levels. The annual average PM 2.5 levels in Delhi have fallen by 20% since 2013. “Air policy action has started kicking in – with an environment compensation charge on trucks, action against other sources. We are responding to action but the levels are still very high in the city, it only shows that action has to be sustained to meet clean targets,” Roychowdhury told the Times of India.